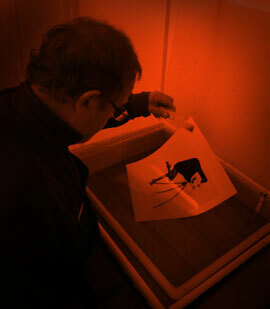 Printing by hand only, onto Resin Coated Multigrade paper. Since all sizes of print involve the same amount of skill and care, the price difference between the print sizes we offer is mainly to do with the increased paper costs. We can print your photos with you onsite at the lab, and you can participate in the printing process to ensure that you get the exact print you want from each of your photographs. We charge this by time plus materials, with the first hour costing £35.00 and subsequent hours at £20. Chemicals and print materials charged at cost. "If you do not see the service listed that you require, please ask, as there is hardly anything in darkroom work that I have not done at sometime over the last 45 years." "Nothing can beat a real silver print for tonal range and detail..."